This summer it would seem that the 80’s have returned with a vengeance. Optimus Prime is living large and dominating box office receipts and Cineplex’s across the nation. However, more importantly to Joe fans everywhere, the 25 th Anniversary collection figures are starting to trickle into online e-tailers and brick and mortar locations across the country. 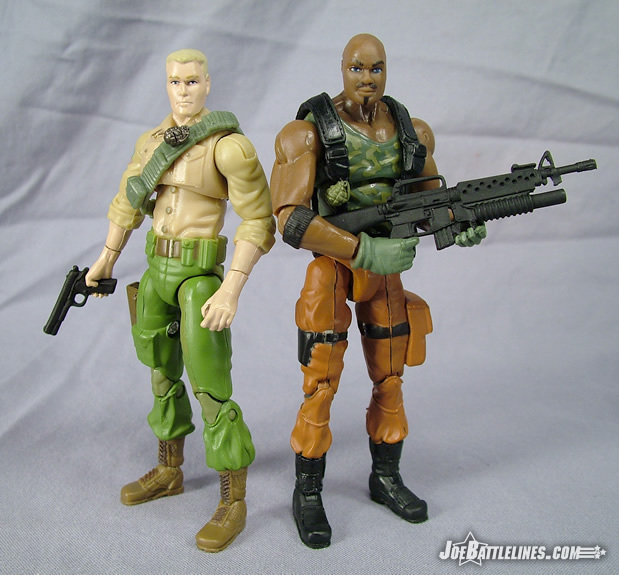 Featuring brand new construction and classic deco’s, these figures have been eagerly anticipated as the “best RAH Joes ever” and have already been announced as the vanguard of a whole new era in GIJoe: A Real American Hero. Do these figures, with their new builds and lack of the signature o-ring live up to the hype? Read on, and find out one Joe fan’s opinion. 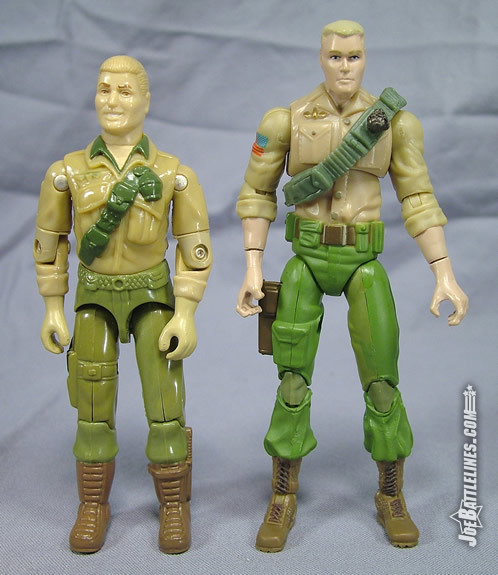 When it comes to Duke and his signature look, most fans can agree that the v1 Duke in his tan shirt and olive pants is the very definition of the character. 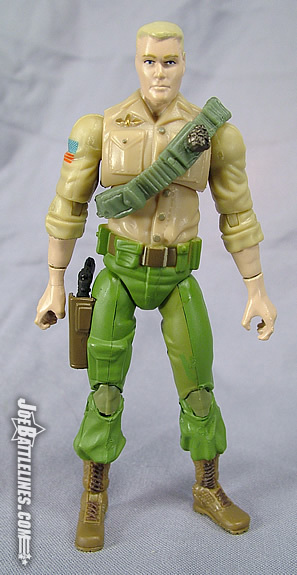 As such, this is the design that Hasbro chose for the 25 th incarnation. The design is classic—and the figure does a decent job of capturing that look. The shirt is slightly wrinkled to simulate the appearance of fabric – although I’m not quite certain as to what is going on down her his belt on the left hand side. The pockets are nicely sculpted and all of the buttons are painted in gold trim—as is his Ranger badge on the right hand side. 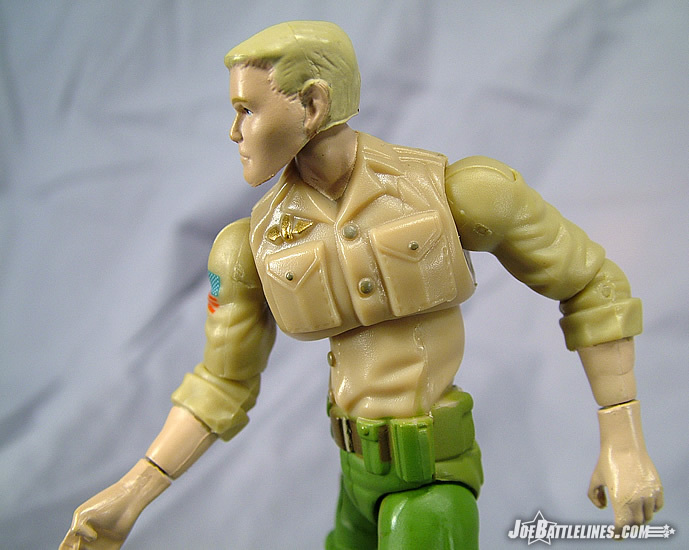 In fact, the entire shirt and the upper arms are actually molded in tan plastic which makes for a nice consistent color across the board. Even the forearms and head are molded in the tan plastic, with the flesh tones being painted (a bit thickly) on. 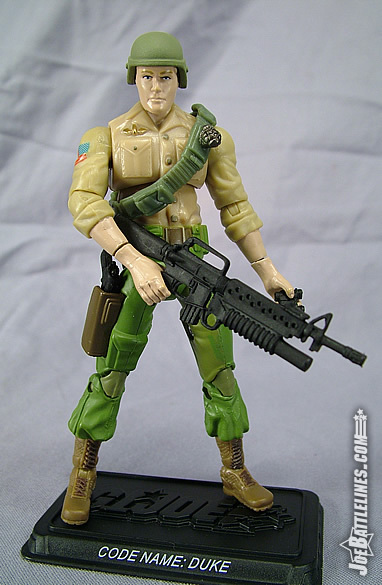 The figure’s legs might also be molded in the same plastic as the pants are also painted as opposed to molded. The applications on mine are rather inconsistent—with the colors on the left leg being noticeably different on the outside from the inner leg. 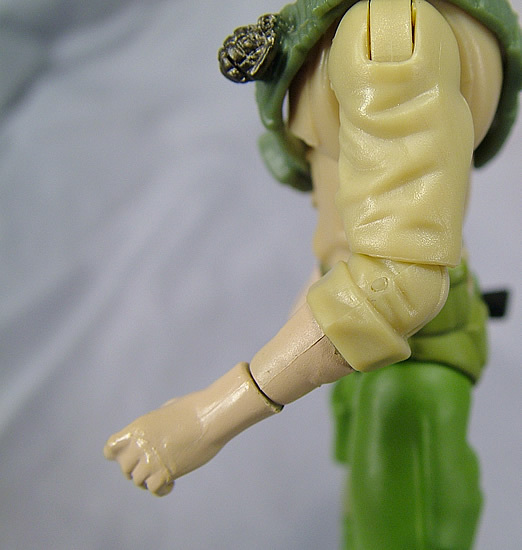 The lower legs are rendered in dark brown plastic to match the boots, with the pants cuffs also painted olive. The paint applications are better here than on the legs—which might have been painted by someone in a hurry to get out of the office on a Friday afternoon. 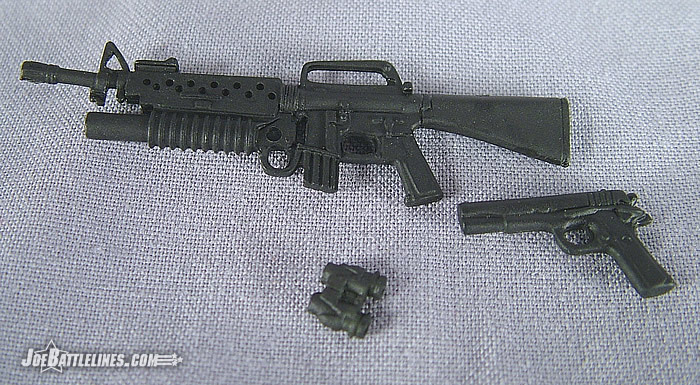 There is a sculpted holster glued on to the right thigh which serves to hold Sgt. 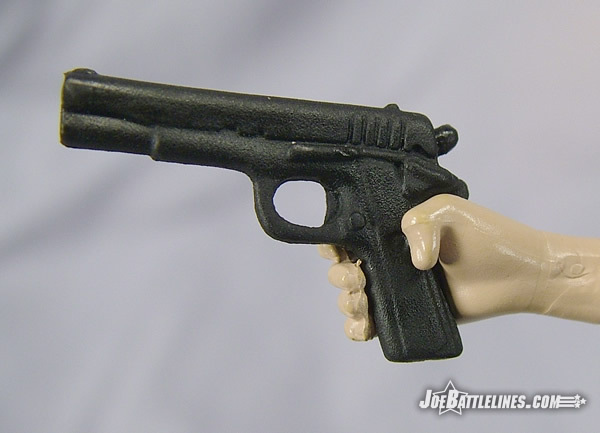 Hauser’s sidearm. 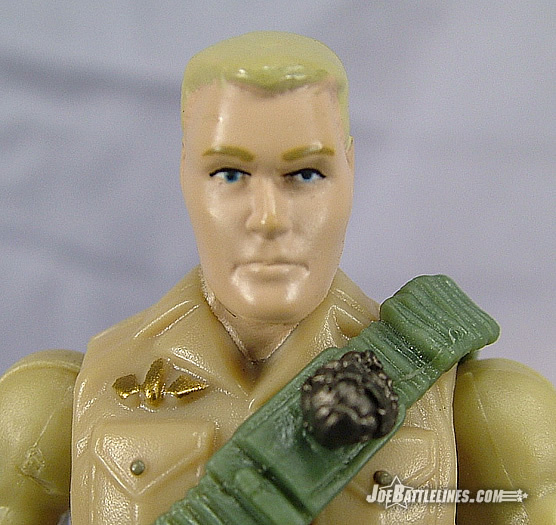 It’s also interesting to note that Hasbro chose a decidedly more animated look for Duke’s head sculpt. Perhaps it’s the painted flesh tone that causes this but I don’t see this figure as anything other than an animated action figure. As such, he stands out even from the other figures in this collection. What makes this figure a bit different from previous version of Duke is the change in construction. 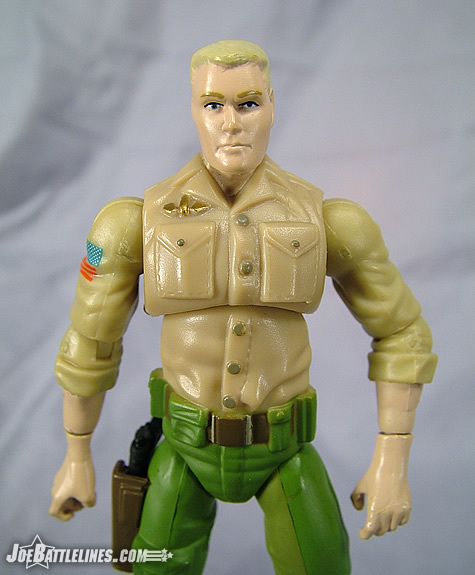 Unlike both A Real American Hero and GIJoe vs. Cobra era figures, this figure is sans the signature o-ring. As a result, the figure’s lower torso and waist are now one piece of plastic, with the waist joint being replaced by the mid-torso joint. In theory, this change was made to allow for the removal of the o-ring (which was deemed not cost-effective) as well as to more naturally simulate the movement of the human body. The joint is evocative of the renowned Microman figures from Japan which offer an insane level of poseability in a figure rendered in 1:18 th scale. The results are mixed as this new joint offers a decent range of side-to-side rotation. The forward and backward motion, however, is extremely limited with Duke only able to either “slump” or stand upright. He won’t be performing any sit-ups any time soon. The lack of waist joint, while more natural in terms of movement, is rather limiting as the figure looks a bit odd when the mid-torso joint is moved more than a few degrees to either side. This figure features something that both fans of the Microman and Marvel Legends figures have enjoyed for a long time and that is the double-jointed knee. Duke can now bend his leg to touch the back of his thigh which works well in achieving “Spider-man” crouches. I’d find this feature useful if the waist were not so restrictive—but more on this in a moment. The figure also has rotating hinged ankles offer a new degree of movement in the feet. This is a nice touch and simulates the ankles found previously in the final GvC version of Duke which also featured hinged ankles. I’m not quite certain as to how useful the side-to-side rotation will be but it does help somewhat compensate for the lack of mobility found in the waist. So far, I’ve given a pretty dry run-down of the figure’s design. Now it’s time to talk about the shortcomings of this line—and there are a few. (If you need to hit the rest room, now is a good time.) What makes this figure a severe disappointment in my eyes are the steps backwards made in terms of the figure’s articulation. 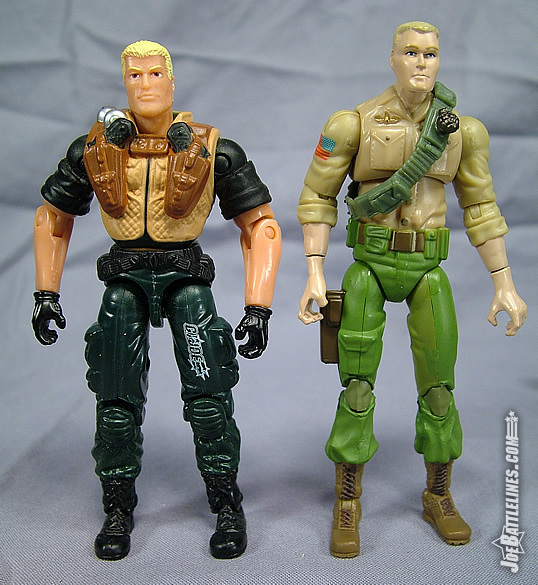 I’ve been a Joe fan since 1982 and one of the selling points of the original line that drew me away from Star Wars was the sheer poseability of the figures. 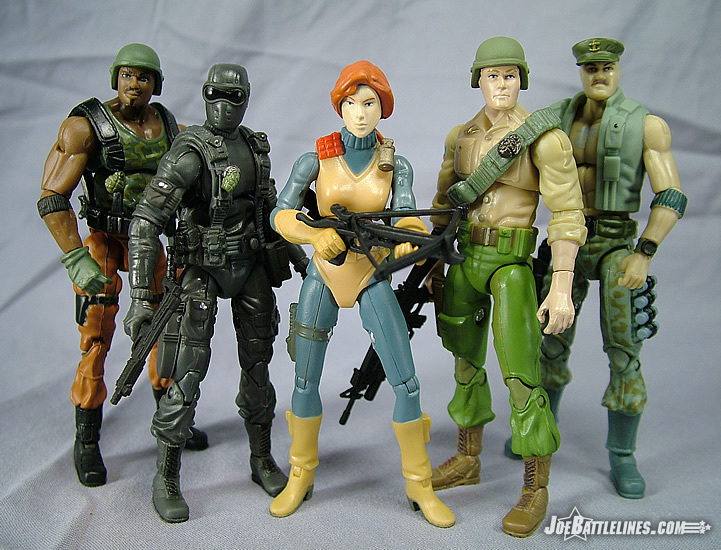 The Joes back then ran circles around the competition from Kenner and other toy companies and set the standard for articulation in my mind’s eye. With the 25th Anniversary, it would seem that Hasbro has chosen “form over function” and focused more effort on the sculpting of the figures than they have on the poseability of the pieces. Starting with the elbows, Duke is incapable of bending his elbows to a 90 degree angle. In fact, he can maybe achieve half of that before the restrictive nature of his molding kicks in. As such, achieving any sort of reasonable two-handed grip on his rifle is an arduous task made only more frustrating by the rubbery nature of his hands. I worked for several minutes with Sgt. Hauser before I gave up and just accepted the fact that he’s not capable of the kinds of poses that his VvV counterparts could achieve. 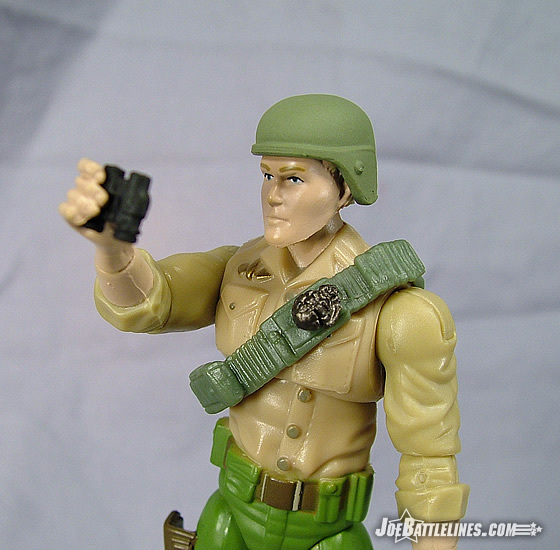 Even more amusing (or not, depending on how much you were looking forward to these figures) is that Duke comes complete with a pair of binoculars that he can hold no where close to his eyes. Talk about practicality! Duke’s elbows aren’t the only shortcoming found in this figure, however. Due to the nature of the new lower torso/waist piece, Duke cannot sit as naturally as his predecessors. Instead, he’s reminiscent of the v-crotch female figures of other toy lines who can only sit down with their legs spread apart. Not only that but he’s also incapable of bringing his legs to a 90 degree angle relative to his spine. In other words, he can’t sit properly without spreading his legs in a manner that Sharon Stone would have envied on the set of “Basic Instinct”. Normally, I’d assume that the mid torso joint was meant to compensate for this but since it only allows a slight bit of forward motion, the result is a position that I’ve seen in many an 8am class in college held by students who are attending class but are desperate to stay awake during the lecture. This isn’t the Duke that I was expecting and to say that he’s a disappointment is a bit of an understatement. I’ve seen posts on various forums where people have mentioned taking dremels and X-acto knives to their figures to shave down the crotch and free up more movement. Personally, I think this is bunk as I should not have to do this with a product immediately after purchase. This is akin to buying a brand new car and then having to alter the frame so that the doors open properly. It represents, in my mind, a catastrophic failure by the design team to think this new construction through to its logical conclusion. To my mind, any change in an already functional design should be made to ENHANCE its functionality, not to reduce it. 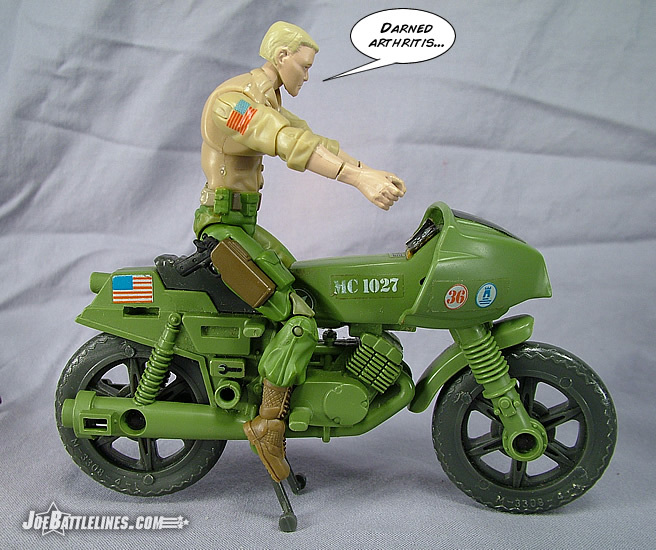 In the case of the 25 th Duke, he’s actually LESS poseable than his GvC counterpart—with only the rotating ankle joints and the double-jointed knees exceeding the range of motion found in the original. All of these shortcomings, in my opinion, should have been caught during the design phase. A mock-up of this Duke would have been seen to be less mobile than his predecessors. However, these made it to production and this body is also used for Flint which means that two figures will now be rendered “for fixed display only” due to a massive failure in the design process. When you add in the rather fragile nature of these figures and the use of soft plastics in the extremities, you find yourself left with a figure that I don’t believe will survive either the test of time or first exposure to a bunch of children nearly as well as its predecessors. 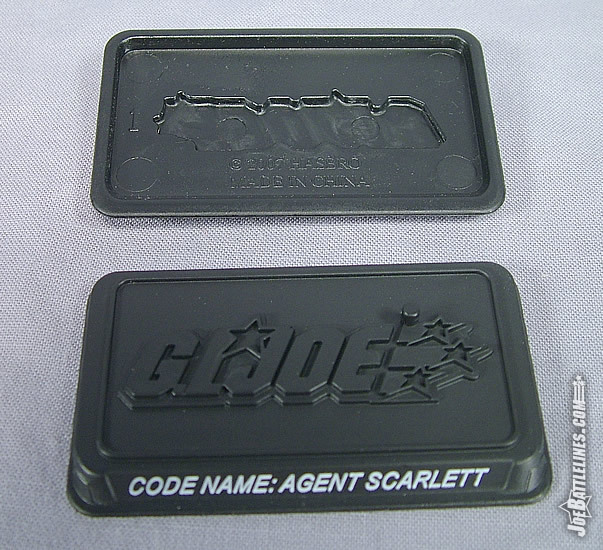 I think that in all honesty the 25 th Anniversary line is going to prove more divisive to the GIJoe fandom than anything else to date. 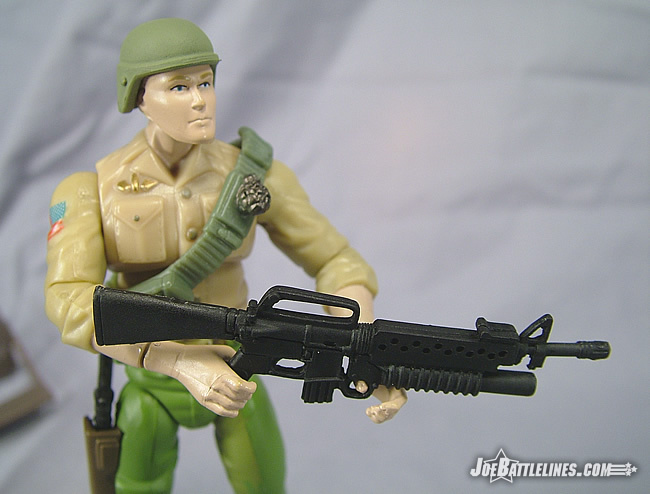 Hasbro has announced that the new construction is to be the standard for all Joes going forth—which means that unless there are major changes to the design and construction, a great many fans are going to simply walk away from this one. I also don’t see these figures holding up to an “afternoon with the children” nearly as well as even the Valor vs. Venom figures of a few years ago. 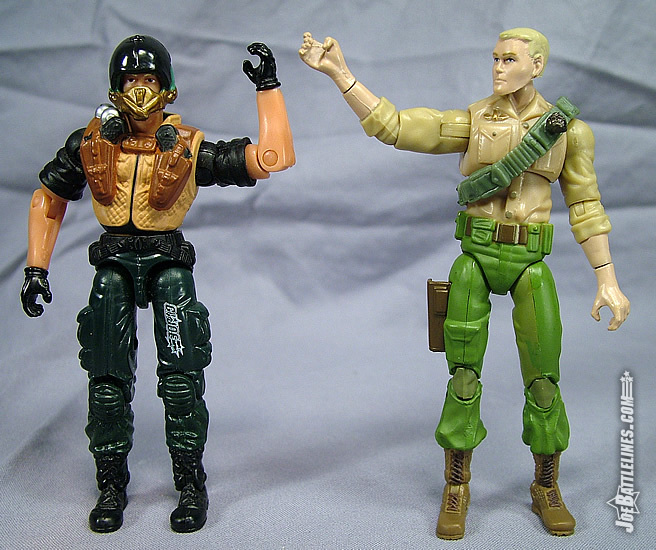 These are figures that are truly designed for “display not play” and Duke, along with the Cobra Trooper and Gung-Ho, seems to embody the failures of the line more than most. Honestly, after opening these two packs I’m only finding myself happy with about 50% of the figures and I honestly don’t see myself acquiring these for any other reason that to provide further reviews to the fan community. I guess sometimes you just can’t go home again.